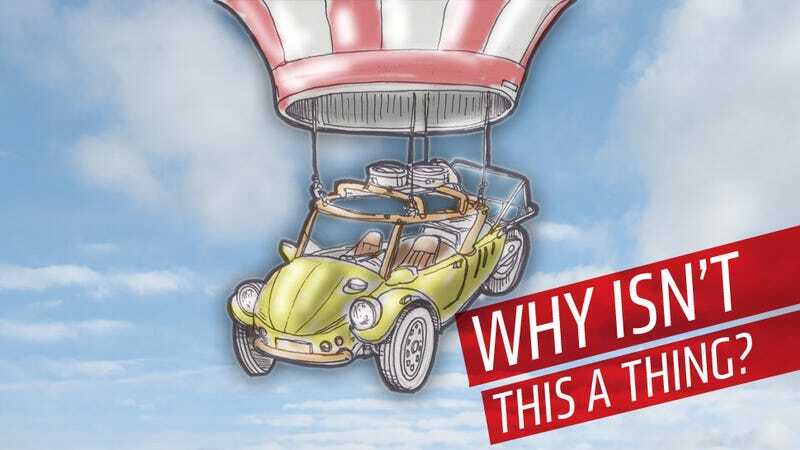 Why Doesn't The Hot-Air Balloon Car Exist? No matter how many rational arguments you make or how much reminding you do about how bad people normally drive on the ground, there will always be those who dream of a flying car. Which is why I'm so surprised I've never seen anyone try anything like my terrible idea here: a hot-air balloon car. The idea came to me as I've been testing out the Campagna T-Rex this week. That three wheeler weighs only 1100 lbs, and is classified as a motorcycle, freeing it from all manner of safety regulations and whatnot. I was thinking about other possibilities of such a lightweight but street-legal platform when it hit me: this thing could fly. Well, maybe float is more accurate. There's so many issues with flying cars — complex mechanisms, skill level and training, and the fundamental difficulty of piloting a heavier-than-air craft — that maybe the answer to the flying car puzzle is to accept that it will only be a novelty, something for enjoyment. If that's the case, you can lose all of the complex, dangerous parts of flying a fixed-wing aircraft and look instead at the most calm, leisurely sort of air-travel. Ballooning. I'll admit, I know very little about ballooning. I have no idea where all the hard-core balloonist bars are in LA, and I've never even been up in one. So I'm perfectly qualified to design a hot-air balloon car. Here's what I'm thinking: the car itself would be a three-wheeler, something like a cross between the T-Rex and a Velorex. That would let it stay very light and avoid all the heavy safety and other equipment needed by a real four-wheeled car. I'm thinking a strong, light tube-frame structure, with outer panels of thin plastic or possibly even a fabric. Motorcycle running gear would be used, most likely something less potent (and heavy) than the T-Rex' 160 HP BMW inline-6, but still with enough oomph to haul the folded balloon envelope when needed. A fairly common balloon envelope size for a 4-6 passenger balloon holds about 105,000-120,000 cubic feet of hot air, which gives it the ability to lift between 1650-2400 lbs. That's plenty for what I have in mind. The car would be a two-seater only, and with passengers and gear I think can come in at about 1500 lbs, using the weight of the T-Rex as a benchmark. The only extra equipment needed would be a pair of burners to heat the balloon's lifting air, and I'm imagining that those would be fed from the same gas tank that the car's engine uses as well. It's possible these could be propane fed as they usually are, but to save weight I don't see why gasoline-burning heaters couldn't be used. Unless, of course, my ignorance is a big factor here. The car would have a special rack to carry the folded envelope when not aloft. I think this should be possible, based on pictures of folded balloons in trailers I've seen, but this is the biggest question mark, really. Being able to easily transport everything on the ground or the air will be key, as it will open up a lot of freedom to the daring balloon-car owner. The weight of the folded balloon may be an issue for the smallish engine the car would have, as well as some likely handling issues as well. But I'm still in the early stages here — once I get that Kickstarter going and get some eager ballonist/automotive engineers on board, I'm sure this'll all work out. The idea seems so obvious, I feel like I must be missing some key element that makes these impossible. I've been looking around, but so far I haven't seen anything online of anyone trying something like this, save for a few whimsical drawings or art installations. There's a flying car/glider with a similar design, but no balloon. The possibilities are very appealing for a recreational vehicle. Drive out to some pretty country, unpack the balloon, float on up, enjoy the view, drop down at some quaint little sloppy joe shack, drive back home or somewhere new — what's not to like here? Okay. Time to tell me why I'm an idiot!